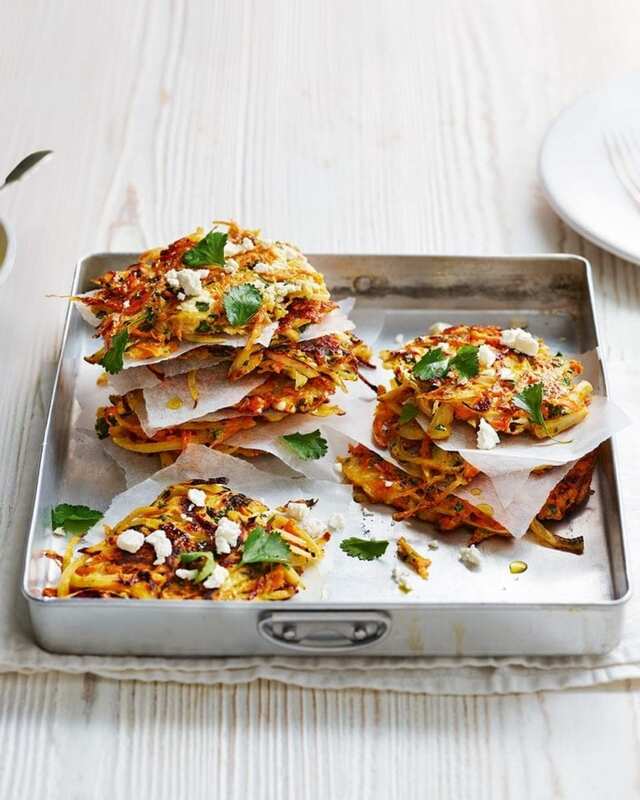 Feed four for less than £4 with these healthy and budget-friendly carrot fritters. Drizzle over the spiced Greek yoghurt and enjoy for brunch or lunch – with extra feta cheese. In a mixing bowl, combine the flour, ground cumin, ground and fresh coriander, garlic, olive oil, eggs, carrots, onions and 75g of the feta. Season with salt and pepper, then stir well to coat the vegetables in the egg mixture. Heat a large non-stick frying pan with a generous glug of oil over a medium heat. Using your hands, shape 8-10 patties from the carrot mixture. Fry gently, in 2-3 batches, for 4-5 minutes on each side until golden brown and the vegetables are tender. Drain on kitchen paper and cook the remaining fritters, adding more oil as necessary. Meanwhile, heat the oil for the spiced yogurt in a separate small pan over a low-medium heat. Add the ground spices and cook for a few minutes until fragrant. Remove from the heat and leave to cool. Stir the spiced oil into the yogurt and season with salt and pepper. Serve the fritters warm with the spiced yogurt and scatter with the remaining fresh coriander and feta. Make the fritters a few hours in advance, stack with squares of greaseproof paper between them to prevent sticking and keep chilled. Crisp up in a hot oven for 10 minutes before serving.